My sister-in-law got married this weekend! It was a very pretty wedding and we are very excited for her! My husband, daughter, and I all got to be a part of the wedding party. 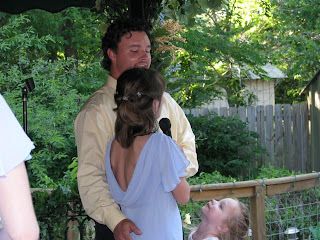 N, as a groomsmen, Bella, was a flower girl, and I was a bridesmaid. N and I also sang a duet. I wish I had a recording of it. I would post it here and that alone would be enough to get me plastered all over the front page of Humor-Blogs.com. Bella, stole the show. 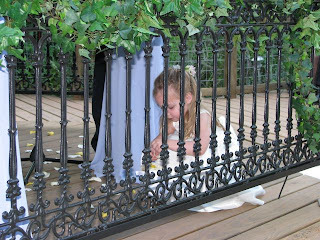 She was a little restless already by the time she got to walk down the aisle. She had kept the bride’s wedding party entertained with scary faces in the mirror as we waited for the wedding to start. She panicked every time she heard a male’s voice in the hall outside our “waiting” room since Aunt Laurel had told her we were hiding in there so Uncle Marvin would not see us before the wedding. She was so paranoid with every man’s voice and every knock at the door. Convinced that Uncle Marvin was going to burst through the door at any minute and see his bride too soon. then promptly began to collect all the petals from the stage that had been purposely scattered there before the wedding and put them into her basket. I stopped her and she came and stood by me. About a minute into the wedding she realized she could not find her brother. 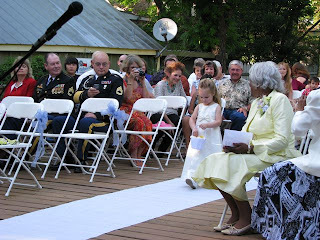 Bella knew Buddy was supposed to be sitting with Nana and Papa during the wedding but she hadn’t spied him yet. “Where’s buddy?” She asked in an exaggerated whisper. I shushed her. She moved around a bit, turned around to see behind her. Where she spotted Nana, Papa, Buddy, and Hoss. She notice Papa taking pictures and was sure to pose for the camera. She swung her basket over the gazebo railing so he could get a good shot of it too. She asked a couple of times if she could go stand with Daddy. I, of course, said No. All in all I thought she did fairly well. Nothing was much louder than I loud whisper. She stayed on the stage and on one side or the other of me the whole time until I stepped forward to sing with N.
We sang, “Bless the Broken Road” by Rascal Flatts. I am so, so frustrated by my performance. I have only sung in front of people a few times and I do not sing real well, in my opinion. My husband and mom say differently but who knows. Nevertheless I am not confident in doing it. But my husband and I had practiced quite a few times and I was feeling okay about it. My voice was shaky at the rehearsal and I didn’t do as well as I had during our private practices but I had hoped that had taken care of the nerves. Instead, my voice shook through the entire song. I have no idea if I was ever on the right note at any point during the song and for a good portion of it I was singing the harmony with N instead of the melody like I was supposed to. At one point I had dared to open my eyes and look at N. He smiled and his eyes shifted downward. There, hugging his leg and looking up at us, was Bella! I do not know how long she had been standing there watching us but it made me smile. It was such a very sweet moment. She did eventually tire of this as well and began again her quest to clear the stage of all rose petals. As much as I love Laurel and Marvin I was so glad to see the whole thing end. I was also glad I no longer live there and will not soon have to face all the people I humiliated myself in front of. At least it all made for some good photos! And though I did a terrible job singing a romantic song with my husband. One that has been one of “our songs” for a while now, was awesome. I have always wanted to get to sing with him. He has a beautiful voice. *Photos were taken by my daddy. I told him I would say something nice about him in my blog for going to the trouble of emailing the pictures to me. So here it goes. Daddy, you are so wise, and handsome, funny, and fun. Your laugh is contagious. Your cooking is delicious. Your smile is bright. Your hugs are warm. You’re kind, charming, gracious, brave, and wonderful. And I love you! Was that good enough? I love the picture of Bella looking up at you! Very sweet. I'm sure the song was good. We're always our own worst critics. I would never be brave enough to stand in front of all those people and sing (plus no one would want to hear it - singing is not a talent of mine), so kudos for that. In answer to your question and in the incessant word of Bella ... "MORE!" P.S. I think you have a great voice (when it's not whining). I just loved this post, but my computer at home is so funky when I try to comment on people's blogs so I tried and tried and tried and aaaaargh! So anyhooo...this was so cute and I love how you got all nervous singing with N.
When Hubby and I got married he looked down and his 2 year old niece was wrapped around his leg trying to get him to sit with her during the ceremony. She has eyed me with jealous suspicion ever since. Oh and I love your dad. Does he have a blog? He totally should. He just cracks me up! Jenn, I too love that picture. My daddy captures GREAT candid shots! Daddy, I know you're just saying that because when have you ever heard my voice that I was not whining?! Jonny's mommy, I can't tell you how thrilled I am that my most supportive comments on my blog are to do with my dad's comments and how awesome they are. Thanks!! J/K. He kind of has a blog journeychurch.com. It's his churches web site under journal. But he does not write near often enough! I love him too! He's pretty awesome!